Calendars are an integral part of our lives. In the earliest times, human beings calculated time by observing the periods of light and darkness that alternated continuously. These days everyone is using a calendar, whether you are a busy individual, juggling a family with kids or just need to keep your head on top of things — a digital calendar is the solution. But there are several major problems with the current offering of calendars — most of them are just a digital representation of pen and paper. They are static, and don’t fit the current dynamic modern lifestyle. And usually — you need to work for your calendar and it doesn’t work for you. At times when people are overwhelmed with data, deal with way more things than they used to — there is a huge need for an assistant that will guide them throughout the day. This is why we are focused on developing the best personal assistant experience. Since most of the data about time: like events, tasks and other related information relevant to the schedule, is based in calendars, we decided that building a personal assistant on top of a calendar would be the best way to save people time. As busy individuals ourselves we understand how demanding modern life is, and how difficult it is to juggle between your career and your family life. The concept behind 24me is to provide one place to manage your schedule, and to automatically complete your tasks and errands, and that sets 24me apart from other calendar apps. As a team of geeks and designers, who think about every little element, we came up with 24me, and we have been named ‘App Store Best of 2014’ by Apple. Your events, tasks, notes and real life accounts all fully synced and appear on your calendar. No need to use multiple apps to get a sense of what’s happening next. 24me provides a very simple and organized way for you to navigate throughout the day. 24me is also available for Apple Watch – and provides you with the best personal assistant experience on your wrist. 24me integrates to Google Calendar, Microsoft Outlook, Microsoft Exchange, Yahoo! Calendar, Apple iCal and many more. No need to put usernames and passwords. Just login and it’s all set up for you. 24me provides Day view, List View and Month view, to you can choose the best way to use it. Choose which accounts you would like to connect, and 24me will connect securely and remind you about upcoming bill payments from your service providers, special events of friends and family, financials, social networks, Reminders from your native Reminders app and many more. Alerting you about the right time to leave for your meetings based on traffic conditions. Provides you with street view of the target destination, and opens your default navigation app with the right address. Agenda of meetings and to-do’s planned for the next day. Don’t forget to take your umbrella. We are also the only calendar app to provide long term weather outlook so you can plan ahead events knowing what would be the weather in a few months. Notifies you about birthdays of your dear friends, giving you the time to greet or send a gift. We are committed to building the best personal assistant experience to help boost people’s productivity to new amazing limits. Our mission is to save you time so you could focus on the things you love to do. This is a beautiful and useful app. The only request I have is to be able to choose which of my Google calendars I’d like to receive notifications for. As you may know, Google allows a user to create multiple calendars tied to one account. I have my personal calendar, my daughter’s calendar, my son’s calendar, and a calendar for fun stuff going on around town, just as a few examples. I’d like to be able to select which calendars I receive notifications for. If there is a features request link I should submit this to, let me know! Thanks for your consideration. – Make sure those events don’t have a reminders set on them. Is it possible to use the Google Calendar Reminders with your app? Is the Reminders function supported? Can you please elaborate on this? What do you mean by Google calendar reminders? With 24me you can set reminders for events and tasks in a very flexible way. My 11-year-old daughter downloaded the application on her telephone. It is possible to synchronize my calendar on its application, so that we used the same? That should be easy to do. Add your calendar account to her phone. For iOS it’s done under iOS Settings app > Calendars. Then 24me will sync your calendar automatically. I would like to sync my Outlook system with my 24 me account. My appointments have synced with 24 me, but i would like to sync my tasks. I am also wondering if my outlook a can sync with my 24me tasks. 24me is great for mobile, but I am looking for integratigration from my PC planning with my Mobile. In case you use an Exchange account on your Outlook, you can sync your tasks using that Exchange account to your device. Make sure you have that accounts connected under iOS Settings app > Reminders. Then your tasks will sync to the Apple Reminders app. Then you can link 24me to Reminders under My Links. All your tasks will then be synced. This is something we plan to support in the future on Android too. Is there a way to sync with an Outlook calendar on a desktop (not on the iphone). We do not use exchange. You need to use an online calendar account which is connected to your Outlook to be able to sync with 24me. It can be Google, Yahoo, Exchange, etc. Then any device which is connected to that account either using Outlook or any other program can sync with 24me on your device. Hi, I’m liking the look of this app, can you tell if it has different views for the calendar? I.e., I need to be able to see weeks or months at a time (so ideally the app needs to be rotatable). Thanks in advance. We currently have 2 views for the calendar – Day and List view. We plan to add more views going forward. They indeed sit in the bottom part of the app to leave space to you daily items. The image you attached might be from past versions of the app. how do I get my tasks from my google calendar to synch on 24me? This is something we plan to add. 24me currently supports a full sync with iOS Reminders app. We rely on a managed exchange service. I always get distracted and forget the start times of meetings. Assuming I can sync Outlook with this application, will the app alert me by vibrating on my wrist in advance of a meeting at whatever interval I set? Yes, this is exactly how it would work. Make sure you have your exchange account connected on your device. I just downloaded the app. I have a few different calendar apps I use (one for personal and one for work). I never did like the native calendar within the ios system so I don’t use that. I’m using the outlook app and the google calendar app instead. according to the tutorial I would have to use the ios calendar sync under the settings. can I not sync this to other apps? if not, this is pointless for me to use. I support multiple executives and would like an app that pulls the data from multiple platforms without having to resort to the ios. I found the ios to be clunky and confusing since I couldn’t color code for each executive. 24me indeed uses iOS to sync with your calendar accounts. Once you do that you don’t have to allow other apps to also sync with iOS. Under iOS Settings app > Privacy > Calendar, you can determine which apps have access to your iOS calendar. So simply don’t allow those other apps access under that screen. In case you require further assistant please feel free to contact our support team – support@twentyfour.me. Does any body know, how to chage your email address in 24me? Our support team will be happy to help you with that. Email support@twentyfour.me and send them the details of your request. 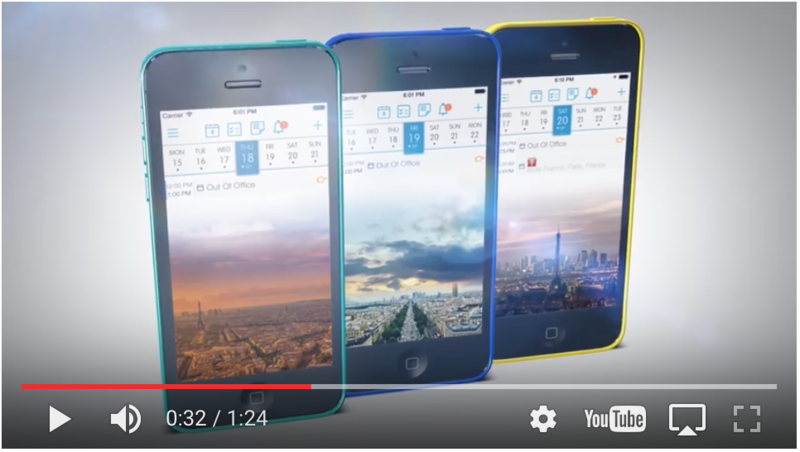 How can you link the 24me calendar with your office 365 calendar? To link your Office 365 calendar account or any other calendar, go to iOS Settings app > Calendar > and add the account there. 24me will automatically sync with it then. Does the data inputed into my 24me app on my iPhone sync with the app on my iPad? I haven’t been able for both to sync well. To sync tasks and notes across devices you simply need to be on the same account on both devices. To sync events you first need to add the same calendar accounts (Google, Yahoo, …) under iOS Settings app > Calendar. Then both devices will be synced with the same events. Then you need to make sure you associate your new events with your online calendar account (Google, Yahoo,…). Then 24me will automatically sync those events. You can see which calendar is chosen for each event by tapping on the event and going to the Calendars tab. There you can see all your calendars and tap on the one you’d like to use. You can also go to Settings > Visible Calendar to hide unneeded calendars and also change the details calendar that will be automatically associated with any new event you add in 24me. I want to create tasks while on my macbook and sync with 24me. Any tips? The tasks sync from the iphone to tasks via icloud. But not the other way around. You can link 24me to the Reminders app and then use Reminders on your Mac to edit your tasks while changes you do will sync to 24me. I would like to add a photo to an existing item (appointment). Is that possoble? 24me currently supports attaching photos to tasks and notes. We plan to also add it to events. My outlook tasks synch to IOS reminders and then to 24me. But tasks entered in 24me will not synch to reminders. When you add a new task in 24me, and then open Reminders, it’s not showing up? If so, add a new task and assign it with a label, then see whether it is added. Please contact our support team (support@twentyfour.me) for further instructions. Will there be a desktop version? Until our desktop version is ready, you can you ANY calendar app you’d like on your desktop and it will automatically sync with 24me. Can you change the color of the calendars coming from Google in the 24me app? You can change that color by opening the Apple calendar app > Calendar > change the color there. Dear all – will there bi a Desktop Application in the near future? Thanks for getting back to me on that subject. Will there be an Desktop Applicaitino any time soom? From my apple watch I can not predefine a calendar, when I am going to add an appointment the calendar field comes out blank. Good job. So when you create a new event from the watch, which calendar account is it associated with? Can you login on more than one device ? What kind of maps does it use when pick ok my up a location during reminder creation? Because I picked Google maps in the setting and it doesn’t give what the Google maps app gives! 24me uses the Apple maps software of iOS. The setting you mentioned is for the app that 24me uses for navigation – when you tap on the Go button. Hello, until our desktop version is ready, you can you ANY calendar app you’d like on your desktop and it will automatically sync with 24me. Am I integrate multiple calendars from different sites (ex: apple cal + google calendars + outlook)? If so, how? I am not finding it in the settings. Simply add all your calendar accounts under iOS Settings app > Accounts & Passwords, and then 24me will automatically sync with them all. Until the PC version of 24me is ready you can use ANY calendar app you’d like on your PC and it will automatically sync with 24me. Do You Have plans make 24me for Windows or for browser? We do, although we don’t have a release date yet. How is the browser version coming along? It’s indeed an important project. We don’t have a date to announce yet, but as we mentioned above, you can use you calendar app of choice online or on your computer and it will sync with 24me. my calendars may contain sensitive information – where do you store the data used for synchronization? Calendar info is saved locally on your device and also on the calendar account you use (such as Google, Yahoo, etc.). It might sometime also be saved on 24me’s secure environment on the cloud. I have a calendar made on outlook that I would like to transfer to 24me but i cant seem to findout how. 24me sync with every calendar account which is under your iOS Settings app > Accounts & Passwords. Is your account there? How am I able to change the colors of select calendars in the iPhone app? Until this is available directly via the app, you can go to the Apple calendar app, tap on the Calendars button on the bottom, and change the color from there.